Devices are everywhere nowadays. Every second person has a smart phone, a tablet, some way of instantly connecting to the internet. We have always had a policy in our house of moderation in all things. So some TV is fine, some computer time, some outdoor time, some book time (actually, as referenced in a previous post, if people want to read books, we tend to let them!). One thing we’ve always been very strict on, however, is that when we have visitors, we TALK to them, PLAY with them, INTERACT with them! A few weeks ago we had a group of friends over. The children were aged between 6 and 13. The grown-ups headed outside to the patio in the warm summer afternoon sun. The children (after some grazing on the flash high tea) headed INSIDE. One by one, our under 5′ visitors came out requesting our wifi password so that they could do “internet stuff”. My first, admittedly knee-jerk, reaction, was to say no. You are all here socialising. For goodness’ sakes, get outside, play, swing in the hammocks, throw a ball. The visiting children looked at me like I’d grown a second head. Finally, with some misgivings, we handed over the password and a laptop and two tablets were connected. Our smaller fry (the youngest three, 13, 7 and 7) hauled out their tablets as well and joined in the fun. From outside, all we could hear was laughter and chat. When we poked our noses inside, the eight children were sitting clustered around the couch, peering at each others’ devices, all linked up and playing Minecraft, laughing, talking, and totally interacting on TWO levels – the cyber level and the physical level. The two youngest, who are 6, and did not have any devices, were sharing and taking turns on the older children’s devices. After a while, one of the visitors tried to sell my 13-year old son on the benefits of Tumblr by showing him cute cat pictures, and she then shared some deeply personal information with him while sprawling across him in comfortable fashion. So my question to you, dear readers, is this. Should I be accepting of this new kind of interaction? Were the children playing together? Yes they were. Were they interacting? Yes indeed. Were they displaying good social behaviours – sharing,kindness, tolerance, conversation, jokes? Well, yes. Did the interactions they were having allow them to form a deeper connection? Yes, unequivocally. Am I just a dinosaur? I guess I am. I’m beginning to accept that things are different in this new technological age, and I do appreciate many of the advantages that this age offers. But I still find it difficult to accept a group of kids sitting around and playing on their technology rather than being outside playing or finding a face-to-face game. So I come back around to my key phrase of moderation. Moderation in all things. I guess as long as the children are still interacting in a positive way, then it’s all good. But I’m still going to continue to kick my kids outside; to get them playing games in person; to do a variety of activities, to play sport, to learn how to talk to adults and other children. And in the meantime, I’ll enjoy the fact that my little boys call their older siblings (when they’re at their ‘other’ houses) to see if they’ll group up with them on Club Penguin. How do you feel about this? Would you make a different call? 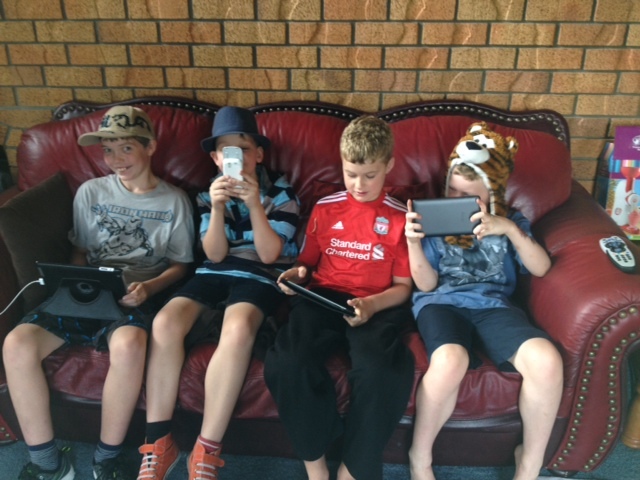 So one of these devices is not actually connected, but this is my three younger boys and their cousin, all happily engaged in playing. Moderation and balance are definitely the watch-words. I tend to feel that the kind of techno-interaction you describe is just not as ‘valuable’ or positive as, yes, getting outside and playing, but as long as it’s handled as you seem to have handled it, I guess it’s ok.
Two anecdotes: We had friends visiting Budapest, and their kids had brought their Ipads. They took them everywhere, even out to restaurants. And while their son did show ours Minecraft and such, there seemed to be little real interaction. While allowing kids to take technology to dinner may make meals out easier for the adults, I’m simply not down with that. Kids learn a lot by watching and listening to adults, and those are hard to do if your face is glued to a screen. In another case, we spent a weekend in the countryside with another family – no electronics, not even any toys from home. One of the best things about the trip was watching the kids devise interesting games and competitions with whatever was at hand – sticks, rocks, a flowing stream. Left to their own devices, kids will use their imaginations to create their own toys, and I tend to think that’s a lot better for the brain and body than a glowing screen. The obvious problem is when you have kids sitting around all the time, getting no exercise and becoming effectively addicted to their technology. Can you stop kids from being enchanted with their electronics? I think not. But can you find some balance and build some ground rules for using that technology? I think you’d better, or your kids will eventually look like plum puddings and be just about as bright. I couldn’t agree more about the balance thing. We have very strict rules at home about no using technology at the table – phones, tablets, iPods etc. this automatically applies to when we’re eating out as well. I’ve always been a no TV when we have visitors person as well. There are times, especially when your kids are little, when it can be useful to have a distraction device, but it’s also great for them to learn how to sit nicely at the table, talk politely to the servers and have a conversation with the others at the table. Dying arts maybe? These are things we try in our house at least! Thanks for your input as always Matt. My mother was horrified at the idea that one day my son was playing minecraft with his friend while they skyped and listened to spotify together – each in their own houses. She thought this was the beginning of the end. My only problem with it is that I have to get dressed before I can leave my bedroom. Just turn off the video on Skype I say!